Our product range includes a wide range of double wheel bearing, upvc bearing, upvc window bearing, upvc sliding bearing, 16mm roller and 14 mm upvc window bearing. Upvc bearing is used for big door for sliding. 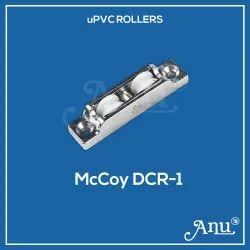 Upvc bearing body made from MS and roller made from Copper or Brass. Upvc window bearing is used for upvc sliding window for smoothly open and closed window. Upvc window bearing body is made from MS material with nickle plating. Roller made from derlin or nylon. Upvc Sliding Bearing is used for smoothly operat upvc window. Upvc Sliding Bearing body made from MS with nickle plating and roller from nylon or derling material. Upvc braing is used for sliding window. upvc window bearing body made from zink dia cast material. RRoller made from nylon. Upvc window bearing is used in sliding mosquito shutter for light weight shutter. Upvc window bearing body made from zink dia cast material and roller made from nylon. Upvc window bearing is used smoothly operat sliding window. Upvc window bearing is made from zink alloy cast material. Upvc bearing is used for big window is mainly used in balcony. Upvc bearing body is made from MS with Nickle plating. Roller made from Nylon.